29-30 Jan, London, Learning Technologies Conference and Exhibition. The London School of Business and Finance - a private college with links to several UK universities - has been fined £38,000 and ordered to stop teaching a number of its programmes in Canada for allegedly offering courses unlawfully. The Ontario Ministry of Training, Colleges and Universities has issued a “restraining order” which states that LSBF is an “unregistered private career college” that does not have approval to offer a number of courses in the Canadian province. Emerge Education is an ed-tech accelerator programme backed by the Said Business School, University of Oxford, and Hub Ventures, whose previous start-ups include Meducation, which aims to disrupt the medical publishing industry. Last month two large groups of Brazilian private universities have filed for initial public offerings, which together could raise as much as US$730 million. The biggest is led by Ser Educacional Group, which operates universities with over 100,000 students in 11 states. The other company, Anima Educação, runs postsecondary institutions with 48,000 students and is considering buying 42 further institutions and a company that offers online distance learning. McGraw-Hill has launched ALEKS Placement, Preparation, and Learning (ALEKS PPL) – a system that uses open-response questions and adaptive technology to assess students' maths knowledge and place them in the appropriate course for their level. Intel has acquired Kno, the education software and e-textbook platform developer which offers access to a catalogue of more than 200,000 e-textbooks from publishers including Cengage, Wiley and Houghton Mifflin Harcourt. Kno will now become a part of Intel Education, which is focused on creating integrated learning tools - hardware, applications and content. Pearson has launched a new FT Education API that offers students and educators the opportunity to access free content from the Financial Times, 30 days after original publication. Textbook (digital and squashed trees) rental company Chegg says it hopes to raise $172.5 million in its IPO, based on an initial stock price of $9.50 to $11.50 a share. And Houghton Mifflin Harcourt has filed plans for a $274 million IPO. …and Twitter is worth $ squillions. 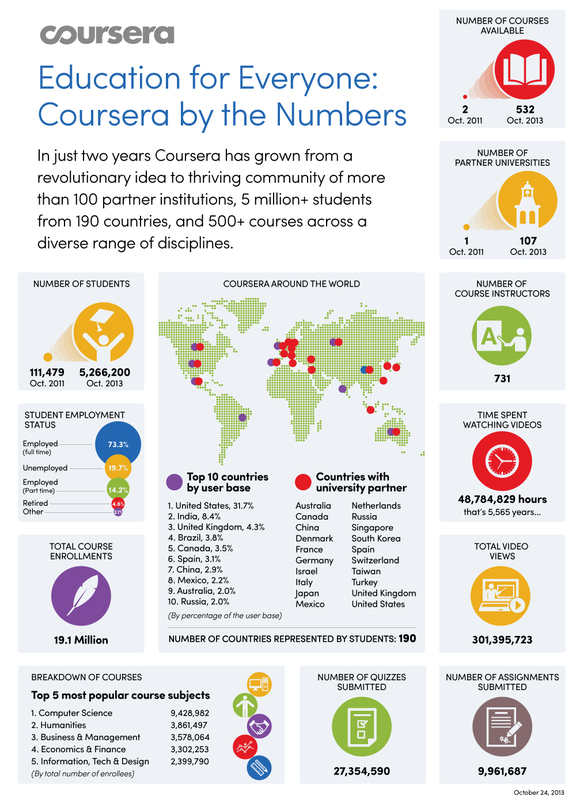 Coursera celebrated its second birthday last month with an infographic that encapsulates the enormity of what they’ve achieved: 532 courses from 107 partners; 5.2m students in 190 countries who’ve spent a collective 5,565 years watching videos and submitted 9.9m assignments. The one telling stat that’s missing is the educational qualifications of those students, maybe because MOOCs in general still seem to benefitting more of the haves than the have-nots? Coursera’s partner list was swollen by the addition of 13 new institutions from 11 countries spanning the Far East, Russia and Europe, including the University of Manchester which will be offering four courses in health, climate and sanitation. Developing countries will benefit from an agreement signed last month by the World Bank Group and Coursera. MOOCs will be offered as part of a new Open Learning Campus, “where practitioners, development partners and the general public can more systematically access real-time, relevant and world-class learning”. The first MOOC - “Turn Down the Heat: Why a 4°C warmer world must be avoided - is expected to start in Jan 14. Coursera is launching Global Learning Hubs which will offer people around the world “physical spaces where they can access the Internet to take a Coursera course, while learning alongside peers in an interactive, facilitated setting.” There are currently 30+ locations, many within US embassies as part of the US State Department’s “MOOC Camp” initiative. Google has launched Helpouts (“real help from real people in real time”) and Coursera plans to use this to offer a mix of free and paid tutoring sessions for its Machine Learning course. Elsevier will be providing edX with book content for up to five MOOCs in computing, engineering, maths, science and criminal justice. Material will be provided for free online as part of the course materials and can be purchased in soft or hard format at a discount by those enrolled in the MOOC. As part of the agreement, edX will provide Elsevier with anonymised usage data that can offer insights into how students are using and accessing the content. Berlin-based iversity went live last month with its first 6 courses and 115,000 enrolled students. The top three courses so far are “The Future of Storytelling” from the University of Applied Sciences in Potsdam (29,000 students), “Design 101” from the Academy of Fine Arts, in Catania, (18,000) and “Public Privacy: Cyber Security and Human Rights” from the Humboldt Viadrina School of Governance, in Berlin (17,000). iversity hopes to offer 24 courses and enrol a million students by the end of next year. Open Universities Australia has announced that its free online learning platform Open2Study has attracted 100,000 enrolments, with 53,000 students from more than 180 countries undertaking one or more of its MOOCs. Open2Study began by offering 10 four-week courses in April. Seven months on, 32 courses are available with 60% of enrolments now from overseas nations – the top three being the US, India and the UK. The Chinese government is speeding up the development of its own MOOC offerings and is actively encouraging the import of quality courses to China – as long as they do not contain politically sensitive content. For example, Tsinghua University has a team of 30 people now working on MOOC platform development and another team working on course content. Tsinghua has launched its own platform, XuetangX, which is already hosting nine courses from Tsinghua, Peking and MIT. But as the MOOCs flood gates open, university leaders in China are calling for clearer policies from the government on MOOCs. Around 150 participants gathered in Brusselslast month for the Academic Cooperation Association (ACA)-EUA Seminar, Making Sense of the MOOCs. A summary of the event and links to presentations are available via the EUA site. Meanwhile, across town on the Open Education Europa site can be found a European MOOCs Scoreboard which plots who’s offering what across Europe. The University of Western Sydney’s Jonathan Tapson has pasted MOOCs onto the Gartner Hype Cycle. He shows us just cresting on the peak of inflated expectations as we’re about to plummet for about two years’ into the trough of disillusionment (good luck FutureLearn) before gradually climbing up to the plateau of productivity by 2023. Really? Cast your mind back ten years to Windows XP, IE6, the first colour phones and 250 kbps ADSL. It’s a brave person these days who looks forward to 2023. And FutureLearn has added a further 9 MOOCs to its course list. Cindy Londeore has also had good and bad experiences of two MOOCs. Her interpretation of having a “basic knowledge” of XML did not match that of the provider and she found herself struggling by week 3. In contrast, the prerequisites for her second course were more accurate and the modular structure with formative questions was more supportive. Cindy’s experiences also form a chapter in a new online book, Learner Experiences with MOOCs and Open Online Learning. The University of London has revealed that 210,000 students signed up for its four initial Coursera MOOCs. Around 90,000 of these were regarded as “active students” but only 8,843 received a "Statement of Accomplishment" for successful completion. The OER University was launched on 1 Nov by Sir John Daniel. OERu will allow students to study courses from 31 institutions around the world online at no cost. Students will be able to pay a fee to have their work assessed for academic credit, which would then be recognised by any of the other participating universities. Wayne Mackintosh, director of the Open Educational Resources Foundation, the NZ-based organisation that is coordinating the development of OERu, said that the option given to students to gain credit for their work made OERu more attractive than typical MOOCs. Initially OERu will offer two credentials – one undergraduate and one post-graduate, and they are currently experimenting with micro Open Online Courses (mOOCs). MERLOT was an early pioneer of OERs but has been overshadowed by MOOCs of late. Now along comes MERLOT II with a revamped website that allows users to search the 40,000+ resources, upload their own or create new ones using MERLOT’s Content Builder. Meanwhile, NYT questions the value of the four-year-old University of the People. It has an annual budget of $1 million, 14 paid staff members, 300 volunteers and runs on donations from foundations such as Hewlett, Gates and Carnegie. Only 1,500 students (from 137 countries) have enrolled since it opened and there are currently only 736 active students. According to Laura McInerney, writing in the Guardian, “If heaven is indeed a place on earth, I'd put money on it being an Open University graduation ceremony.” She bemoans the effects of government funding cuts on OU fees: “People who slipped through the education net first time around … need low-cost options for accessing higher education. If they, and their families, have the determination to do all the rest of the hard work, the least they can expect is that politicians on both sides will fight to support them.” Thanks Laura - the cheque’s in the post. And a report from Universities UK, The Power of Part-time: Review of Part-time and Mature Higher Education, warns of the potential for “market failure” under England’s £9,000 fee regime, recommending that such provision be intrinsic to higher education policy instead of an “add-on”. The review, chaired by Bristol’s VC, Eric Thomas, was commissioned by the government in response to the 40% fall in part-time undergraduate numbers in England since 2010-11. David Willetts, writing 50 years after the Robbins Report was published, suggests that our HE system has become “lopsided”, with institutions focusing more on research than on teaching students. He argues that over the years, universities have focused primarily on research “because that is where the funding and prestige came from” but that the “pendulum has swung too far away”. The number of English language-based courses taught in countries such as Germany, France, The Netherlands and Sweden has soared by 38% in just over a year; France alone has seen a 43% rise. Masters courses in English – covering the full range of disciplines including science, the arts and humanities – now account for almost a third of those advertised in continental Europe. A new NMC Horizon report finds that the use of data analytics, instruction through mobile devices, online learning (including MOOCs) and virtual/remote laboratories that emulate real ones are the technologies that will have the greatest impact on “STEM+” education over the next year. Longer term, we’ll see greater use of gamification, wearable technology, machine learning and virtual assistants. The findings come from 39 “acknowledged experts” who analysed dozens of articles, reports, essays, RSS feeds, and other materials pertaining to emerging technology. IMS has launched the Connected Learning Innovation Challenge in an effort to encourage plug and play integration of learning apps, tools and content. An “app challenge”, designed to encourage participants to develop innovative open educational apps, platforms, and tools for connected education, is open to any institution and has an entry deadline is 1 Feb. Winners will receive a Learning Impact medal and $1,000 at the 2014 Learning Impact Leadership Institute. A separate survey of over 700 US students found that 92% use their mobile devices for non-class activities during class times. Main offences are texting (by 86% of students), checking the time (79%), e-mail (68%), social networking (66%), web surfing (38%) and gaming (8%). And a study by Noel-Levitz shows that older students are more satisfied with online learning than younger ones, despite the latter having grown up in an online world. A report from the Pew Internet and American Life Project shows that, of the 6,200 American adults surveyed, 43% own either a tablets or an e-reader (up by 10 percentage points in 10 months). Greatest tablet ownership was amongst 16-17 year-olds (46%), whereas the 30-49 age group owned most e-readers (30%). In between these two groups, the 18-29s topped the phone ownership rankings, with 97% owning any mobile phone and 79% owning a smartphone. Ofcom’s third annual infrastructure report includes mobile coverage on roads for the first time. This shows that, whilst motorways have good 3G coverage, just 35% of A and B roads are served by all four mobile networks and 9% of roads have no 3G coverage at all. In the UK's towns and cities, 22% of connections are taking advantage of superfast speeds (>30Mbps), up from just 10% last year, and the number of public wi-fi hotspots in the UK has doubled from 16,000 to 34,000 over the last year. Britons shift 650 million gigabytes of data in an average month. JISC’s The Challenge of Ebooks in Academic Institutions aims to help orientate senior institutional managers and to support institutions in the effective adoption and deployment of ebooks and ebook technology. The site offers a main report, three infographics and links to guidance and case studies. The Autumn 2013 edition of the Journal of Interactive Media in Education (JIME) journal is now available. Papers from authors including Josie Taylor, Canan Blake and Eileen Scanlon examine the OU approach to pedagogy and technology, designing online learning or blended courses and the use of Pinterest for an interdisciplinary subject. Scientists from Washington University have been struggling for the past decade to decipher the complex structure of an enzyme which might hold a critical role in building a cure for AIDS. Gamers playing spatial game Foldit have managed to collectively determine the enzyme’s structure in ten days. Howard Gardner published his seminal book on seven ‘Multiple Intelligences’ in 1983. Now, writing in the Washington Post 30 years later, he sets the record straight on one unanticipated development that has “driven me to distraction” – the confusing of MI with ‘learning styles’. Gardner explains: “there is strong evidence that human beings have a range of intelligences [linguistic, logical-mathematical, musical, interpersonal, etc] and that strength (or weakness) in one intelligence does not predict strength (or weakness) in any other intelligences.” Trying to relate MI to learning styles or to our five senses is incoherent, so what should educators do? Individualise teaching as much as possible, teach important materials in several ways and with different activities/media, and drop the confusing term 'styles'. Pearson has just published its annual Social Media in Higher Education survey which shows that academic professional use of social media has lagged behind personal use but has increased each year. A majority of faculty now use social media in a professional context (any aspect of their profession outside of teaching) but use of social media for teaching purposes has lagged even more. This appears to be mainly due to concerns about privacy and about maintaining the class as a private space for free and open discussion, plus some concerns about the integrity of student submissions by this method. The Getty Museum welcomed 135,000 students to its two locations last year but it now plans to extend its reach by making more than 80 videos available via the Khan Academy. These include interpretive videos on techniques and materials such as Greek vase-making and glass-blowing, and other processes such as mummification and the production of medieval manuscripts. Getty also plans to develop critical-thinking exercises and quizzes. Launched on 29 Oct, Virgin America’s new flight safety video has already generated nearly 6m YouTube views. Considering most people’s natural aversion to the subject matter, it’s a masterpiece.